Effective HR services can be delivered through any channel –Inhouse, Outsourced, Centres of Excellence, etc. HR practices in 2010 saw Cloud application, multi-sourcing and SaaS trying to innovate business models, improve service levels, and controlling costs. To achieve these, world class organizations are currently working at obtaining HR Transformation. But that, for sure, doesn’t bring us to HR Perfection, especially considering the fact that companies have new options for deployment models (public, private, and hybrid clouds), as well as for service models (SaaS, platform as a service, and infrastructure as a service). The bene?ts vary in terms of efficiency, availability, scalability, and speed of deployment. Perfection will be when captive and outsourced HR operations, with the best suited deployment or service models, influence business outcomes positively and contribute to greater decision making support and opportunities which finally affect the bottomline. HR transformation is a hot topic for ambitious HR organizations with a desire to stay fit and alert as a value adding partner in the business environment. HR professionals are focused on helping line of business to optimize organizational performance during tough times. However, HR teams are often underrating the importance of taking own transformation process seriously. Radical transformation of HR’s contribution to business is not fixed with new organizational charts and new job descriptions – even if it is followed by training in new HR techniques and methods. The HR transformation journey is a personal and professional development process over time. HR professionals need to work on their business driven mindset and associated behaviors supplemented by practical tools to enhance business contribution and qualify the dialogue with business managers. It is not rocket science - but it has to be done to ensure transformation of HR perspective and practices and thereby obtain the intended impact on business results, accompanied by revitalizing the positioning of HRin the company. we develop more competent HR leaders and professionals so that HR delivers greater value to the organization and its stakeholders?
? What are the 4D landscapes that HR leaders are facing in China today?
? What does this mean for HR leaders today and what will it mean in next 10 years?
? What do HR leaders in China need to do, given challenges and opportunities in today’s market? Why?
? What are the key challenges and opportunities facing organisations in China today?
? What does this mean for HR functions today and what will it mean in the future?
? Are HR functions ready/set up to take on these challenges and opportunities?
? What do HR functions in China need to do, given challenges and opportunities in today’s market?
? What are the emerging trends in HR Transformation, globally and in China?
? What should HR focus on and how do functions need to transform themselves to better align with their organisation’s requirements?
? Is the lack of HR capability the biggest threat to the evolution of HR?
? What do you need to change when you go into a fairly new business in HR?
? What can you keep the same in HR from the legacy business?
? What are the top priorities?
? How do you go about change at a global Chinese company?
? How do you measure progress?
? 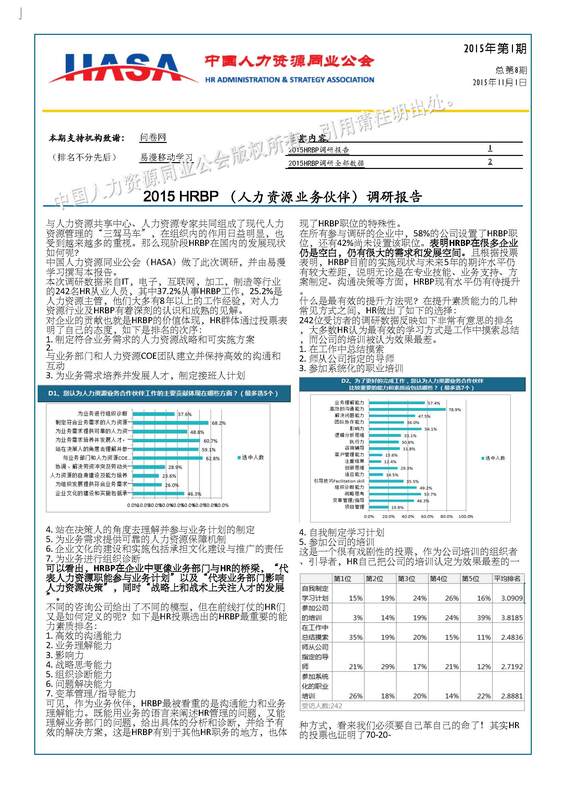 What are the key HR technology trends, globally and in China?
? What do changes to HRMS and Cloud Technology mean for HR functions?
? What is the role of Social Media within HR? How can it be best leveraged?What do these changes mean for the traditional view on HR service delivery models?
? Can some of the HR capability challenges be “by-passed” by the introduction of new technology? In the context of organization transformation, what does it take for corporation to accelerate the pace and improve the quality of their strategy execution?
? Now what? How to achieve the above? According to research and surveys (RBL, McKinsey, clients), it appears that business simulation and experiential learning, customized to the specifics of an organization (culture, market, business model) and to the strategic directions set up by the management team, help organization achieve their desired business results better and faster.
? Is data HR's currency to success in today’s business environment?
? What are companies in China measuring today?
? What are the trends internationally?
? Do HR functions have the right capabilities to make an impact? Women’s role in business and the need to increase women’s representation in the board-room are widely discussed topics across the world today. However, despite a lot of talk, women are still the vast minority in senior level positions. The global average for female board directors is 9.8% (GMI Ratings 2011). For China this number is 8.5%, which is an increase by 1.8 percentage points from 6.7% in 2009.Moreover, China was rated no 61 on the top 100 list in the World Economic Forum Global Gender Gap Report in 2011, a report which links a reduced gender gap with increased economic competitiveness. The low percentage of women at senior and executive levels is due to many factors. In some parts of the world, women often entered higher education and took on professional careers later than men, which means that there simply are not as many women as men with the experience required for board level positions. This is of course changing, as in many parts of the developed world the next generation of women are as educated and experienced as the men. Women also often encounter conflicting priorities between work and family commitments, which do have an impact on women’s prospects to advance and the choices they make in relation to their careers. There are of course, surrounding the two factors above, a multitude of other things impacting women’s progression. These factors will all be discussed in the workshop, as it is widely recognised that increased female representation on boards leads to greater financial success. Globalisation has had a larger impact on companies in China than in most other countries in the world. Globalisation has therefore also provided companies with new challenges, especially around leadership. Leaders will require different skills and experience to what they currently possess. In addition to this, young women’s expectations are very different to those of the women who are in middle-and senior- level leadership positions today. Finally, we will explore HR’s role in relation to this. Are HR functions doing enough today; what are they doing and; what should they to more of, or differently, to better prepare women for successful careers? Referral gets 3% of the registration fee from HASA for each attendee. Please state the referral's contacts in the "Notes" . Referral gets 5% of the sponsorship from HASA for each sponsor. Sign at HASA official website in the following request form. HASA staff will notify you with the payment procedures.